At Golden Gloves Fitness and Boxing, we have dedicated over a decade towards bettering the health and fitness of our members. We ensure that our Fitness and Boxing programs offered in the Greater Toronto Area suits novice members just as well as the experienced individ uals. With over 26 years in the Fitness and Boxing industry, Golden Gloves Fitness and the Boxing gym's head coach Alex is a remarkable resource for members who wish to utilize their Fitness and Boxing abilities in the Vaughan-Woodbridge area to achieve their truly desired physical goals. By using elements of classic fitness training, innovative twists of old favorites, and incorporating Boxing into the mix, Alex ensures that our members’ workouts are never stagnant. It is imperative to continually challenge one's body in order to see results, which is why Golden Gloves Fitness and Boxing club prides itself on the ability to keep regiments fresh and ensure that its members are always progressing. Intense workouts to achieve fast results. Fast-paced exercises to get yourself in peak breathing condition. Great rewards and benefits include: achieving a better physique, balance, confidence, and willpower to continue. Our combination of Fitness and Boxing classes in the Woodbridge area are provided to our members by a professional and personal approach that delivers fast results. 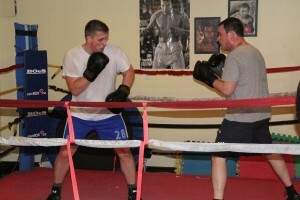 The efficiency and benefits of incorporating Fitness and Boxing in one class are endless. Since 2006, we have strengthened our client's needs. Boxing can burn upwards of 700 calories in a single one-hour workout, it is an extremely effective way for those who wish to lose weight and be able to achieve the next milestone. Through the use of our Fitness and Boxing workouts, you will benefit from a great improvement in strength, flexibility, and stamina in all muscle groups. At our gym, you will tone and facilitate growth of muscles which will leave you feeling accomplished and proud of your new found abilities. It will undoubtedly strengthen your entire body by the repetition of movements, such as: punching, kicking, bouncing, sparring, ducking, and dodging. These activities will condition your legs, arms, and core to the highest ability. Even more so, since Boxing is a form of defense, you will also benefit from learning the extremely practical tool of protecting yourself. You will pick up techniques on various combinations of punches, kicks, and dodges that will give you more confidence than ever if faced with any situation. Our Boxing and Fitne ss classes in the Vaughan-Woodbridge area are also a very effective tool for stress management. With a program that promotes full physical exercise, punching and kicking are the ideal exercises to alleviate both physical and mental stress. It is a great opportunity to release pent up anger and frustration without repercussions! The greatest cause for disease and ailment is stress! For the sake of your body's requests, partaking in our Fitness and Boxing classes will help maintain the overall health of your body. It will allow you to rid yourself of unwanted stress and it will also build a stronger core through balancing and maintaining a healthy heart rate. You will strengthen and you will experience far better blood circulation, which is imperative for the functioning of all organs. Whether you are: novice, experienced, healthy, unhealthy, hoping to gain self confidence or self-empowerment, looking to lose weight, or gaining weight, Golden Gloves Fitness and Boxing gym in the Vaughan area is paramount in your journey in towards acheiving your goals!